The Padres made 2 key moves within a matter of 48 hours, improving their lineup and their ballclub overall. They acquired Miguel Tejada and Ryan Ludwick. In this post, I am going to break down the trades & explain why both trades made sense for the Padres. On July 29th, the Padres bolstered their infield by acquiring Miguel Tejada, a veteran that was, before the trade, a Baltimore Oriole. With the Orioles in 2010, Miguel Tejada hit .269 with 7 homers and 39 RBI. The trade was made because the Padres needed a proven hitter who could play multiple positions. Also, with Everth Cabrera struggling to produce (.199 AVG), it made sense for Jed to go out and get someone that could produce and become an everyday SS. Now, to acquire Tejada, the Padres gave up minor league pitcher Wynn Pelzer. Pelzer will be a reliever. He has a 6-9 record with a 4.30 ERA with San Antonio, can throw up to 95 MPH, but it erratic at times, walking 56 in 96 1/3 innings. Overall, I think it was a good acquisition for the Padres, as they got a solid bat, and, from what i’ve seen watching Tejada play short the last 3 games, a decent glove, too. On the July 31st trade deadline at about 9:45 AM, I turned on MLB Network, which had up-to-the-minute trade deadline coverage. They had Jon Heyman on the phone, and I heard them talking about a proposed deal which would send Ryan Ludwick to the Padres as part of a 3 team trade. The deal would send Jake Westbrook to the Cardinals plus a prospect, Ryan Ludwick to the Padres, and a minor league prospect to the Indians I was excited. A proven right handed OF hitter, solid defender, I was stoked. I then heard it was official. Ryan Ludwick was a Padre. Ludwick had a .281 batting average with the Cardinals, hitting 11 HR and 43 RBI. Oh yeah, and he leads the league with a .448 average with RISP. So then I was wondering who the Padres had to give up to make a Ludwick 3 team deal even possible. Turns out, the Padres had to send Nick Greenwood to the Cardinals and Corey Kluber to the Indians. Greenwood has a 1.63 ERA in 66 IP in single A, and Corey Kluber, a right hander, has a 6-6 record in AA with a 3.45 ERA. What I like about this deal is not only did the Pads get Ryan Ludwick, but got to keep Corey Luebke, Simon Castro, and Keyvius Sampson, their top minor league pitching prospects. I believe Ryan Ludwick will really help the Padres lineup. Also, Ludwick is a good defender, so the defense will be solid out in right-center-left field, depending on where he starts. I am really happy with what Jed Hoyer, the Padres GM, did at the trading deadline. These last 2 and a half months of the season will be really exciting, there’s no doubt about that. I am really excited to watch this ballclub play day in and day out. I don’t know anything about Ludwick, but I’ve watched Tejada with the O’s over the years and he’s always a solid hitter. Good move for the Padres! I could not believe it when my brother Vic told me the Padres got Ludwick and Tejada. ! Padres did well. The SD library has a nice collection of books. I was there one day when I had too much time to kill prior to a game. Some people head to other places, I like visiting libraries and small bookstores. I get to watch your PAdres starting tonight. Honestly, I’m really glad the Padres are buyers this year instead of sellers. They had a terrible year last year… this is great news for them. Hope Luddy kills it for ya! 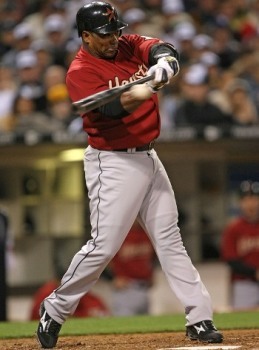 Ludwick is a solid, consistent player– a very nice fit for the Padres. If they can grab him cheap, then it was a great fit. Tejada’s probably another story–I’m not sure if he could still play shortstop everyday, but he can probably fill in there a few times. Both players should be a great addition to your team and not only offset some of those injuries, but provide some depth and leadership for the toughest stretch of the season. I know the Cards did not want to trade Ludwick, but their outfield logjam would have gotten worse, and this is a positive step for both the Cards and Ludwick. Tejada is just a perfect veteran acquisition and should be a great asset to the Padres. Both are great pick-ups who should be able to contribute immediately to the Padres chances. The Ludwick acquisition is fantastic! Tejada can add some slugging too. Maybe just maybe…because you guys are playing so well, Gonzo just might give the Pads that hometown discount they need to keep him. Maybe? Congrats! Tejada is awesome i saw him play when he was an Astros in Houston a couple times and even though there are all the steroid stories the man can play! P.S. thanks for the comment. I didn’t know Everth Cabrera was doing that poorly. It makes more sense why they got Tejada now, lol. I LOVE the Ludwick acquisition. He’s a real ballplayer.